The Kiosk team gets together regularly to have fun and raise money for charity. In May, our company colors were on display as a group of Kiosk staffers ran the Marin Human Race 5K, and in April, we put green fingers to work with a day of gardening for Homeward Bound of Marin. 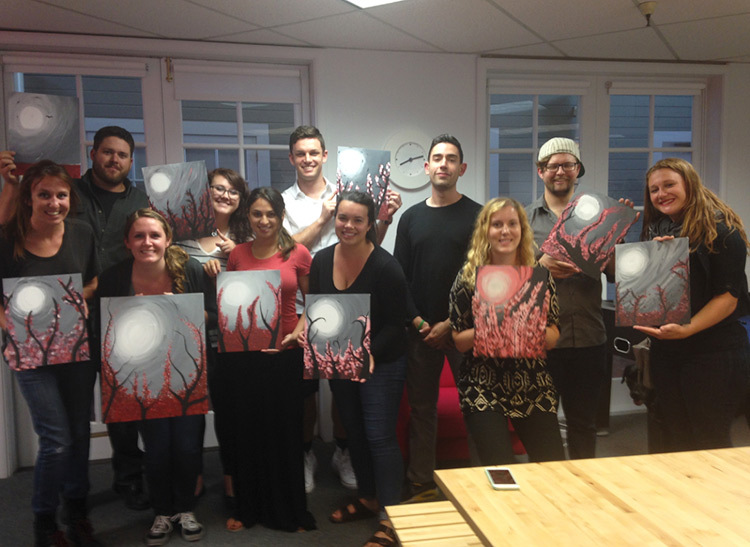 For our most recent, colorful charity get together, we decided to get creative and host a painting night in the office. And no, we didn’t paint the walls. With amateur artist Jessica leading things off, the paint was flowing (as, perhaps, were a few beverages of choice), as Kiosk staffers, friends and family took up the challenge of reproducing an abstract landscape with varying degrees of artistic license. In addition to participating in a fun and friendly paint-in, people dug into their pockets to donate to Homeward Bound of Marin and Doctors Without Borders, the charitable causes that the company is supporting this year.